Originally published on October 1, 2013 on LATER. 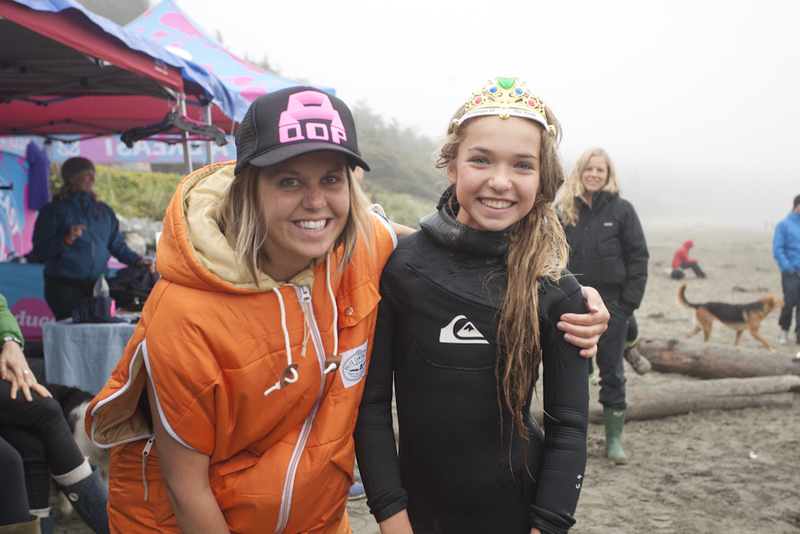 Now in its fourth year, the Queen of the Peak surf championship held in Tofino, BC has grown into a two-day event with approximately 100 competitors. The championship, sponsored by Billabong and The Wickanininnish Inn, includes shortboard and longboard categories, and for the first time, a Princess of the Peak division for under 16s. 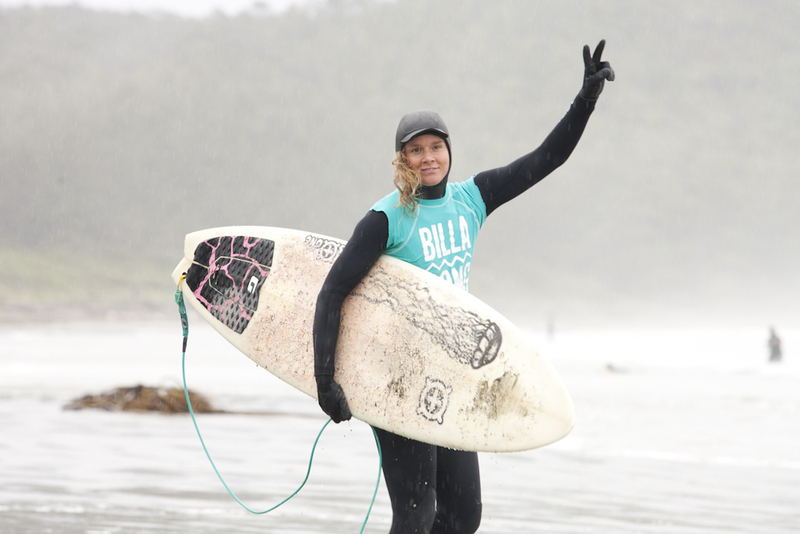 This year’s all women’s surf contest takes place on October 5 and 6, 2013, at either Cox Bay or Chesterman Beach—depending on wave conditions. Competitors vie for cash and prizes during 20 minute heats, in 11-13° water. First place in the shortboard category wins $1500. Top prize in the Longboard category is a new longboard donated by local Tofino shaper Stefan Aftanas and a one night’s stay night at the Wickanininish Inn. “The judges will be looking for a variety of things, but it kind of breaks down into a few categories: speed, power, flow, variety of maneuvers, difficulty of maneuvers and how critical the maneuver is. If you put it all on the line and pull off a powerful, progressive maneuver you will be rewarded. The judging is modelled after the ASP format, which is kind of the world wide standard.” Mike said. Some of the surfers to watch for this year include: Leah Oke from Port Renfrew; Hannah Scott, a local Tofino girl and employee at Surf Sister; Cath Bruhwiler, a born and raised Tofino local; and Tamarah Stevens who always makes it into the finals. Event organizers, Krissy and Mike, have designed the Queen of the Peak with females in mind—offering free childcare, dog sitting, and complimentary massage and chiropractic services for competitors. Other Queen of the Peak events include a wine and cheese welcome reception at Surf Sister and a Billabong surf movie night at Shelter Restaurant. The highlight of the event will be an awards gala with a multi-course dinner at Shelter Restaurant. All proceeds from the Queen of the Peak are donated to Keep a Breast Canada, whose mission is to help eradicate breast cancer by exposing young people to methods of prevention, early detection and support. 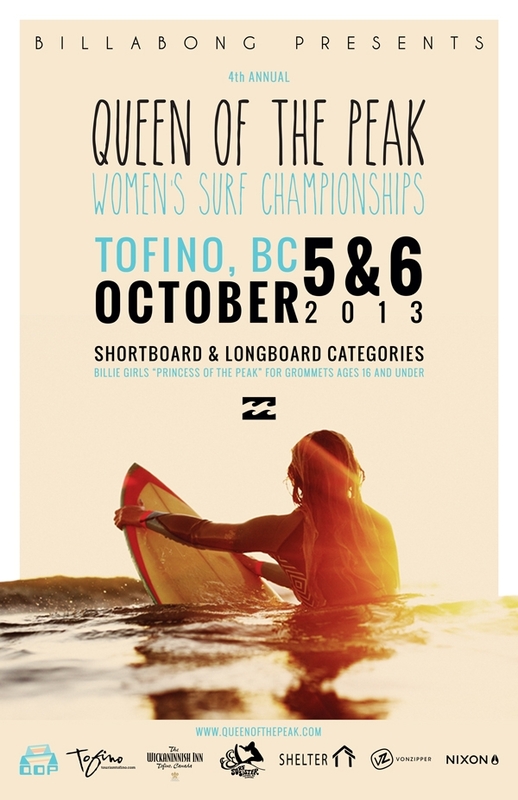 This entry was posted in Canada, surfing, travel, Uncategorized and tagged all women's surf championship, Billabong, British Columbia, Canada, Destination British Columbia, Keep A Breast Canada, Krissy Montgomery, Kyler Vos, longboard, Mike Jacobsen, Princess of the Peak, Queen of the Peak, Shelter Restaurant, shortboard, surf contest, Surf Sister Surf School, surfing, Tofino, Tourism Tofino, Wickaninnish, women's surfing. Bookmark the permalink.